A major aspect of the TPSR model is its focus on student–teacher and student–student relationships. Although icebreaker games can set the stage for learning experiences in adventure education, we use them throughout the learning process in a variety of sport and physical activities to facilitate a more coordinated effort to build connections between the teacher and students. Once students are consistently demonstrating Level I and II behaviors, you should transition to the second developmental stage. Transitioning students to developmental stage 3 within the confines of physical education settings can be difficult. Using Physical Activity and Sport to Teach Personal and Social Responsibility provides practical information to help school or community educators use sport and fitness activities to develop character and responsibility in children. This text, based on Don Hellison’s model, provides samples of units, lessons, and assessments for nine sports and activities. Using Physical Activity and Sport to Teach Personal and Social Responsibility shows you how to implement a character education program in your school or community organization. Authors Watson and Clocksin offer an ideal companion text to Don Hellison's classic Teaching Personal and Social Responsibility Through Physical Activity. In this text, Watson and Clocksin provide the practical tools for applying Hellison’s Teaching Personal and Social Responsibility (TPSR) model to sport and fitness activities. You’ll find samples of units, lessons, and assessments incorporating the TPSR model in teaching basketball, golf, soccer, volleyball, team handball, tennis, yoga, fitness, and adventure education. 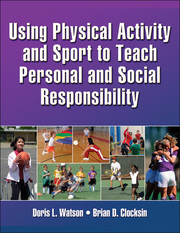 An excellent text for the novice teacher, Using Physical Activity and Sport to Teach Personal and Social Responsibility also offers information and techniques on facilitating youth development in a variety of movement settings and with diverse populations. This text begins with an introduction to the TPSR model that prepares you for practical applications to follow. Part I of the text presents the history and evolution of the TPSR model. It also discusses how TPSR meets current National Association for Sport and Physical Education (NASPE) standards for physical education instruction. Next you’ll find an examination of current research on motivating students in a physical activity context, creating positive learning climates, and facilitating student-centered learning. Part I concludes with a look at current literature demonstrating the effect of the TPSR model in the sport and physical activity setting. Part II centers on methods for teaching life skills and values through nine sports and physical activities. Each of the nine chapters is organized using the TPSR lesson plan format (awareness talk, lesson focus, group meeting, and reflection) in connection to each developmental stage (1, 2, and 3). It includes a summary and recommendations for additional readings. For each sport or physical activity, you’ll find suggested activities for teaching sport skills and TPSR skills in tandem, examples of guided questions, and information on skill assessments. Each chapter includes easy-to-reference tables examining possible instructional strategies to use (such as command, reciprocal, inclusion, and self-check), teaching considerations for each strategy, and how each strategy can guide your students in accomplishing TPSR goals at their developmental level. Part III of this resource includes a chapter featuring profiles of teachers and youth workers who are using the TPSR model effectively. The book concludes with a look at how teaching personal and social responsibility through sport can support the creation of young leaders in school and community settings. Using Physical Activity and Sport to Teach Personal and Social Responsibility offers undergraduates, teachers, and youth workers a bridge to connect Hellison’s TPSR model to their own practices. More than a text on physical education or sport instruction, this book can help you turn sport and physical activity into opportunities to create deeper, more positive connections with students and nuture their personal and social growth. Textbook for physical education teacher education (PETE) courses in methods or curriculum. Reference for youth leaders in recreation and community youth programs, including YMCAs and Boys and Girls Clubs. Doris L. Watson, PhD, is an associate professor in the department of educational psychology and higher education at the University of Nevada at Las Vegas. In addition to her teaching responsibilities, Watson serves as assistant chair and graduate coordinator. Watson has over 20 years of experience in sport pedagogy and physical education teacher education. Her areas of expertise include student learning and development, working with and in diverse organizations, community-based research, and issues in preparing culturally responsive leaders in higher education. She has published work on creating a caring environment in a physical activity setting and facilitation of personal and social responsibility through physical activity. Watson has two decades of experience in facilitating TPSR-based after-school and summer programs for underserved youth ages 8 to 15 years. She has worked with the NCAA Youth Day in creating a curriculum based on the TPSR model. She has also taught and conducted TPSR workshops in Nepal, Ireland, and Trinidad. Also a certified high- and low-ropes facilitator, Watson works with people ages 8 to 40-plus, sport teams, and professionals. Brian D. Clocksin, PhD, is chairman of the department of movement and sports science and associate professor of movement and sports science at the University of La Verne in La Verne, California. Clocksin previously taught at Hofstra University in Hempstead, New York, as an associate professor in the department of physical education and sport science, where he taught courses in physical education methods, adapted physical education, adventure education, and motor behavior. In addition to his teaching duties, Clocksin served as the graduate coordinator for the department of physical education and sport sciences. He also ran Moving and Shaking with Hofstra (MASH), an after-school physical activity program for fourth- through fifth-grade students that used the TPSR model. Clocksin has published 10 articles in peer-reviewed journals and 6 abstracts and invited articles. He is a regular presenter at national, regional, and state conferences on adventure education and decreasing childhood obesity through physical activity interventions. Clocksin is an active member of the American Alliance for Health, Physical Education, Recreation and Dance (AAHPERD). He served as the chair for the Council for Adventure & Outdoor Education/Recreation (CAOER) and as a board member with the American Association for Physical Activity and Recreation (AAPAR). Clocksin also served as a program reviewer and auditor for the National Council for Accreditation of Teacher Education (NCATE) and the National Association for Sport and Physical Education (NASPE) certification programs. He is currently a reviewer for the Journal of Teaching in Physical Education, The Physical Educator, Journal of School Health, and International Journal of Aquatic Research and Education. Clocksin has facilitated TPSR-based after-school, summer, and in-school programs since 2002 with elementary students. He has led workshops on the use of TPSR in physical activity and sport settings and prepares physical education teacher education candidates to use the model. While at Hofstra University, Clocksin directed the adventure education program, facilitating groups ranging from second-graders to corporate leadership teams.